Skimmer problems re. MelaFix Hi there again, <Hi Darren, MacL here.> I recently mailed you about the problems that I was having with my skimmer after using the MelaFix treatment, a copy of this is below. <Just read it.> I have followed all of your advice. After a small initial improvement the problem still persists unfortunately. <I would have suggested the PolyFilter myself. Its always made a huge difference when I have used it. Did you put it where all the flow went through it? Did it turn any colors?> I was wandering if you think that there is anything else that I can do to rid my aquarium of this MelaFix treatment. <The only other option might be to run a diatom (which I really don't like to do in a reef situation) or carbon somewhere? Do you have a canister or something you could temporarily run with carbon?> I just don't know what else to try. I am sure that I will not be using this treatment in my main tank again. Thanks again, Darren. <Good luck Darren.> Medications Devastating Skimmer Performance Hi there <Hello! Ryan Bowen with you today> I have recently used the MelaFix treatment in my marine tank along with the stress coat. I only dosed as stated on the bottle. I switched the skimmer off for a week while using the treatment. 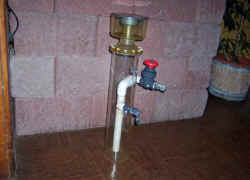 Since then I have added the carbon back into my filter and I have done a 25 percent and two 12 percent water changes. However I still cannot get the skimmer to work properly. It still foams like crazy and it fills the cup very quickly. I thought that the water changes would have solved this. I have not added any more treatment for the last five days. Is there anything else that I can do to get my skimmer back to normal operation, or am I missing something ? <Not to make you feel bad in hindsight, but this is a perfect example of why you should only treat marine life in a quarantine tank- These are the types of problems you'll never foresee when dumping medication into a display tank. Here's what I would do in the current set of circumstances: Keep running the skimmer, but without the collection cup. This way, the oxygen levels in your tank won't drop, leading to further headaches. Next, get yourself some Polyfilter (I believe it's available in the UK). Run it directly in your area for using media, so that water bypass is minimal. After the PolyFilter has run for a few days, take your skimmer out and give it a thorough cleaning-Agents like Melafix can cause havoc on pump performance if left uncleaned. Use vinegar if it's really sticky and nasty. Then, execute another water change, remove the PolyFilter. Then, fire the skimmer back up. Good luck, Ryan> Thanks for your time Darren. Medications Devastating Skimmer Performance Hi there <Hello! Ryan Bowen with you today> I have recently used the MelaFix treatment in my marine tank along with the stress coat. I only dosed as stated on the bottle. I switched the skimmer off for a week while using the treatment. Since then I have added the carbon back into my filter and I have done a 25 percent and two 12 percent water changes. However I still cannot get the skimmer to work properly. It still foams like crazy and it fills the cup very quickly. I thought that the water changes would have solved this. I have not added any more treatment for the last five days. Is there anything else that I can do to get my skimmer back to normal operation, or am I missing something ? <Not to make you feel bad in hindsight, but this is a perfect example of why you should only treat marine life in a quarantine tank- These are the types of problems you'll never foresee when dumping medication into a display tank. Here's what I would do in the current set of circumstances: Keep running the skimmer, but without the collection cup. This way, the oxygen levels in your tank won't drop, leading to further headaches. Next, get yourself some Polyfilter (I believe it's available in the UK). Run it directly in your area for using media, so that water bypass is minimal. After the PolyFilter has run for a few days, take your skimmer out and give it a thorough cleaning-Agents like Melafix can cause havoc on pump performance if left uncleaned. Use vinegar if it's really sticky and nasty. Then, execute another water change, remove the PolyFilter. Then, fire the skimmer back up. Good luck, Ryan> Thanks for your time Darren.